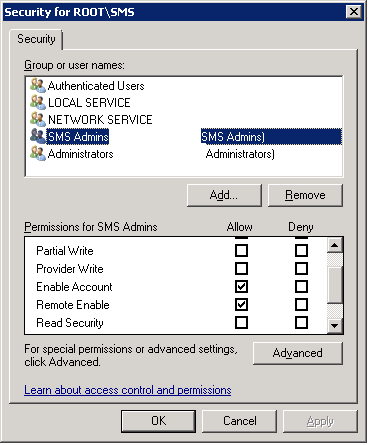 Normally setting up SCCM permissions is pretty straight-forward. However, a couple weeks ago we applied a couple server patches and rebooted our central site server. By Monday, our level 2 help desk users stopped having access to the SCCM console. First we tried checking to see what changed over the weekend. Did someone modify an AD group? Here was the main Microsoft article that we were focused on. Unfortunately we didn't see the helpful tasks at the bottom until today. We got trapped looking at DCOM permissions shown under this article. When we finally looked at WMI permissions by using this test. After finding a problem connecting to the WMI namespace, we then used this article to recreate the correct permissions for the local "SMS Admins" group.